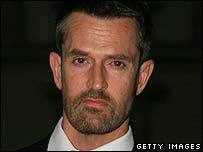 Hollywood actor Rupert Everett shocked the presenters of BBC One's Breakfast programme with a lewd comment about indulging in sexual activity. While discussing his youth with hosts Susanna Reid and Charlie Stayt, the 48-year-old star recalled visiting provincial cinemas. At this point, he made a remark about things that would take place there. A BBC spokeswoman said the comment was "inappropriate", but added that it "sometimes happens on live broadcasts". She added that the BBC had no control over what guests said and that there had been three complaints. "Both Charlie and Suzanna quickly moved him on, with Suzanna pointing out that the interview was going out at 9.09am," she added. "The rest of the interview was fine." It is not the first time Everett - currently to be heard voicing Prince Charming in animated sequel Shrek the Third - has caused upset on the BBC. Last September, Jonathan Ross was forced to apologise to listeners after Everett swore on his Radio Two programme. On both occasions, the Another Country star was promoting his autobiography, Red Carpets and Other Banana Skins. The actor will next be seen playing the headmistress in the upcoming modern version of St Trinian's.